Post subject: Hello from the Santa Cruz Mountains! Nick here in Boulder Creek in the middle of the Santa Cruz Mountains of California. 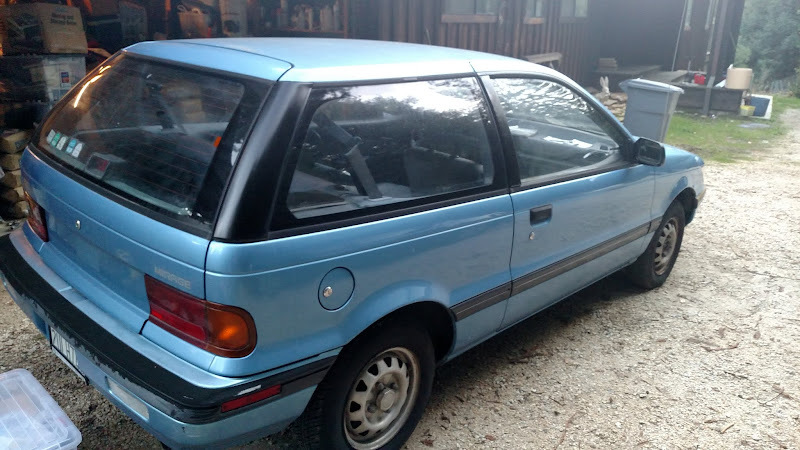 My wife and I recently acquired a 1991 base model/hatchback Mirage with a 12-valve 4G15 and 3-speed automatic transmission. My primary goal is to make this car back into a reliable daily driver. It needs a few parts to get there, but it appears pretty manageable. With about 106,000 miles on the odometer I'm pretty certain the brake fluid and timing belt were from the factory. I've driven the car about one mile so far, to get it to my driveway. I've managed a little work on it so far, including oil change, valve adjustment, PCV valve replacement, Basic but new NGK V-power plugs, and a new 192 degrees F thermostat. The previous owner parked the car last summer after being quoted $800 to fix something with the braking system, which the owner couldn't recall the details of. In light of that limited information, new wheel cylinders and brake shoes will be installed over the next day or two to give myself some assurance that they will work properly. The front brakes and master cylinder seem in good condition, but they ill be getting a more complete inspection soon. 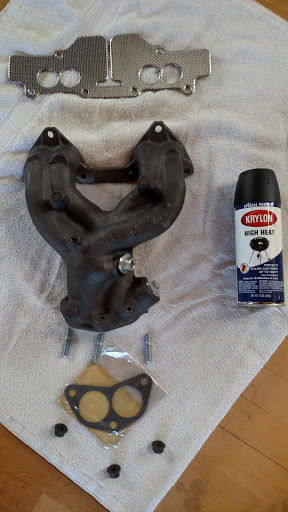 Once the brakes are addressed, I have a cracked cast-iron exhaust manifold I need to remove and replace with the new manifold which arrived yesterday. I imagine that the crack which splits the "Y" of the manifold is responsible for my very rich smelling exhaust thus far. I discovered the manifold crack/leak by becoming very lightheaded and dizzy poking around the engine bay with the car running, and i did not like that surprise so getting the new manifold in is top priority after brakes. The Newb tech and 4G15 tech sections have been very helpful, so I'd like to thank everyone for contributing there. Looks like you have a decent candidate to start working with. Should prove to be a very useful car for you. I've just completed a near 100% teardown of a red version of your car, so there are some very familiar things showing up here. Thank you for the friendly reception, Flying Eagle. While it's still in recent memory, do you recall if the little shoelace of a braided wire ground strap from the exhaust manifold to the body, just below the radiator, and the also very small intake manifold to firewall are the only engine block to frame ground connections? I haven't found any others just yet, but I did use an unoccupied M8x1.25 hole on the cylinder head near the distributor to add a 2 gauge ground cable to the common ground point a couple inches from the battery, where I did some cleaning of the connection. The starter spins up a bit quicker for it. 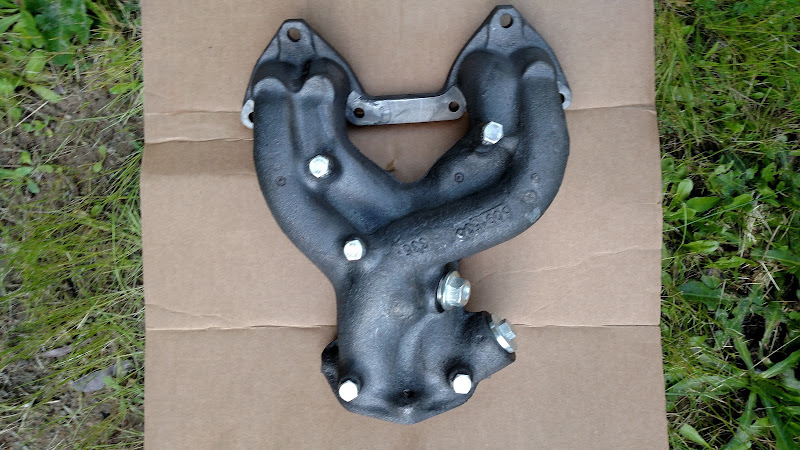 The new manifold I received the other day is Dorman part # 674263, in case any other 4G15 folks find themselves looking for a replacement manifold. The manifold to cylinder head gasket isn't a convincing replica of the original, so I will try to source a proper one with the baffle up top like the original gasket. I laid out the parts of the kit as they will be installed on the car, except the barbecue paint which didn't come with the Dorman manifold. 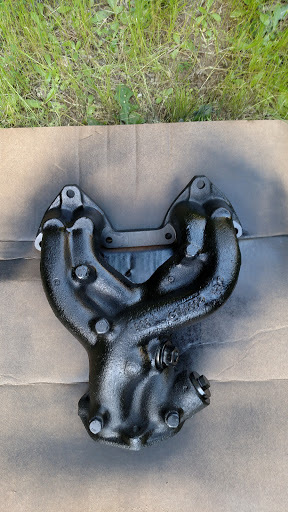 I sprayed off the petroleum-based rust preventative coating using brake parts cleaner, and placed my new heatshield hardware in place to keep paint out of the threaded holes in the manifold when painted. That's as far as I've made it on the exhaust manifold thus far. I'm about 3/4 through the left rear drum brake shoe change. The wheel cylinder was super easy to change out, but this is my first time changing drum brakes on a car. My motorcycle drum brake is decidedly easier because I don't need to crouch and contort to see what I think I need to see while I work on it. I hope to have at least the left rear drum back together today or tomorrow, so I can move on to getting the new manifold installed. I'm sure I'll have some questions going forward, but for now the Hayne's manual is covering most of my reference needs. Update: rear brakes done, replacement exhaust manifold installed, broke two wrenches trying to remove the old oxygen sensor, ordered a new one, and measured base timing as 4 degrees BTDC, close enough for California emissions (5 degrees BTDC, +/-3). Now have a Bluetooth stereo head unit installed, Boss Audio 625UAB. One of the front speakers is dead, and the OEM speakers from my brother's '01 Montero Sport don't sound any better than the original rear speakers. They don't look much different either. While I'm waiting on the new oxygen sensor, a bit more about me: I do field forestry in northwest colorado during the warm season, and now that I'm out of forestry school I job search through the winter, trying to find forestry work in California closer to my wife. It seems that while there are many arborist jobs, there are few forestry jobs in California, partly because of fragmented ownership of forest lands in much of the state and continuing urban sprawl. I worked my way through school as a fisheries biologist, working in the field out of my S2000, and doing felling, timbersports, agroforestry, and soils consultation on the side, using my S2000 as a "work truck". As fun as it is to rev high with the top down through Eisenhower Tunnel commuting between Kremmling and Parker, CO, I'd like to give Sadie the S2000 a break from work truck duty. I'm hoping that the new to us Mirage we've named "Illusion" will become daily driver enough to work out in Colorado, or enable my wife and I to swap cars for my field season. While it's very much in the back of my mind, an eventual manual transmission swap may be in order for Illusion. My wife wants to learn to drive manual and isn't as comfortable about her learning on the S2000 as I am. She's pretty good for a beginner, just too worried about crashing my "first wife" to get comfortable so far. Yo, Banana Slug, welcome to the board! All parts of the Hwy 9, Hwy 35, Hwy 17 are Colt friendly. I checked it personally. Some parts of Hwy 1 are promoting extra speed, dexterity and stamina to the forced induction models. 91 Summit hatch "Sunchaser" R.I.P. 06 Kawasaki Ninja 250r "daily driver"
I'm glad to see that the site is back up after the recent hacking incident. The General Tech thread I had started "Running rich, acetone smell from exhaust. Suggestions?" appears to have lost its contents, but I wanted to provide an update. 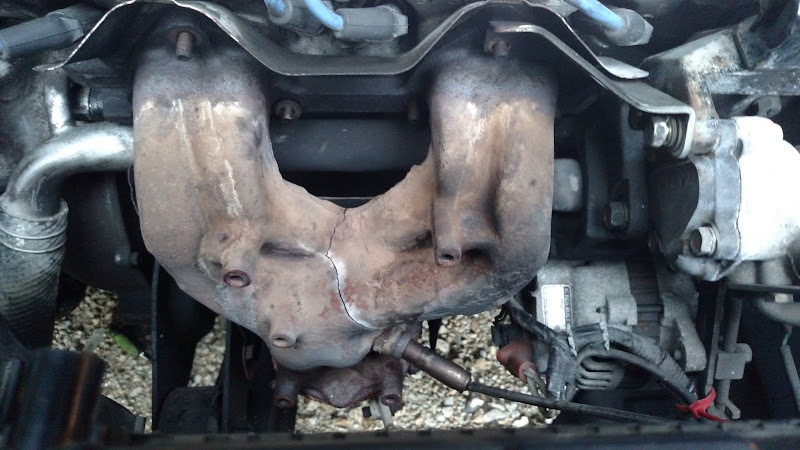 The exhaust manifold pictured here in my introduction thread was part of my problem. The front center stud which was supposed to hold the manifold together with flex pipe portion of the exhaust system pulled the threads right out of the manifold. My best guess is that the stud hole was too large before it was tapped at the factory. The resulting lack of tension on the stud allowed an exhaust leak that must have been detected by the oxygen sensor. Thanks again Flying Eagle for your constructive input on checking out the coolant temperature sensor, timing, and injector resistance values. It took me looking at the right time of day (direct sunlight) with the car positioned just so to catch the slight gap between the manifold and exhaust pipe. I have a new distributor rotor on order to match the fresh plugs, plug wires, and distributor cap. I'm planning on dialing the ignition base timing in from the current 4 degrees BTDC to 5 degrees BTDC. I'm hoping to get the car smogged before I leave for my field season in Colorado in about a week, but it's looking like the Mirage will be staying behind for now. If everything else on the car is tuned properly, head working properly, etc, and the car still fails on HC and CO/NOx with very high numbers at idle and maybe at 40k/25m rolling test, then start looking at your catalytic converter. You will likely have to source a California emission catalyst, but a federal may still let you pass depending upon the leniecy allowed for older cars from original specs/tolerances. I had this happen on my 4g61t motor, even after converting everything including cams back to stock. Everything was stock, but the catalytic was too old and abused. Replaced that, and even after a motor swap and something like 8 years of ownership, one more catalytic replacement just for good measure, it still puffs very clean on the machine. We still have the sniffer test on the older cars that are pre-OBD. Hope this helps. The catalytic is a huge factor in making the 4g15 pass, when everything is otherwise working properly. Japans emission standards were very lax compared to ours, at the time. Passed the California two-speed smog test today! At 737 rpm got hydrocarbon 43ppm, carbon monoxide 0p%, 0.1%O2, 14.9%CO2. At 2583 rpm, got hydrocarbon 17ppm, carbon monoxide 0.03%, 0% O2, and 14.9% CO2. The numbers are far better than I had expected! Your catalytic is obviously working then! Good news for you and wifey; you can drive it legally now. I was quite relieved that everything fell into place just in time before I had to leave for my forestry field season in Colorado. Smogged and title transferred/registered. Before I headed out, I discovered a torn outer CV boot, and while the new battery out of the S2000 got the mirage through the smog test, the car brings either of the batteries I've tried in it down to 11.1v in a short time. I'm hoping it's just the really bad alternator belt (chunks of the ribs fell off when I took it off for inspection), but no shop in town could get the new belt before I had to depart. If the belt doesn't do the trick, I'm interested in putting the Saturn alternator on the 4G15, but I have only read mention of it on the 4G6* engines. I need to browse the junkyards and investigate. So it looks like I have some minor tasks ahead of me when I get back, and I am definitely having a shop do the timing belt when I get home. 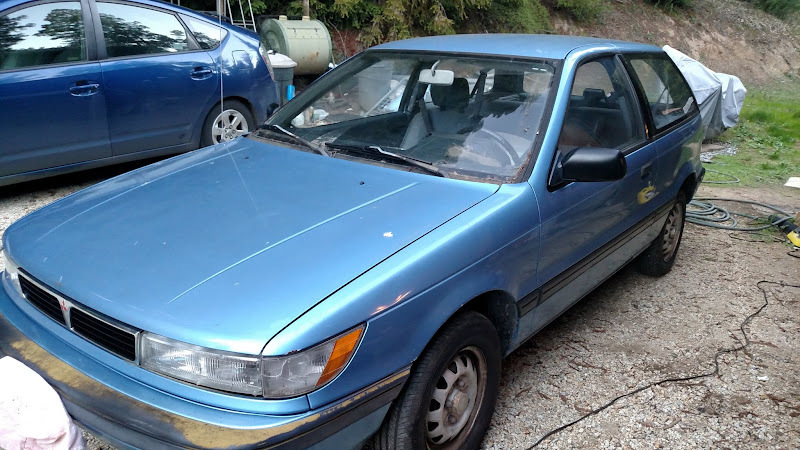 I have an uneven gravel driveway and I don't feel that I can support the car safely while I loosen the crank pulley. I could be lazy and have the new alternator and power steering belts put on for me along with the timing belt, haha. Belts all come off to do the timing belt, so there is no extra labor to install your new belts. Good news! I flew back home for to visit for a couple days and put on the new alternator drive belt (Goodyear Gatorback, now rebranded Continental Elite, nice belts) and power steering V-belt. Alternator output seems back up to snuff and I swapped out the badly sulfated group Napa Gold size 26 battery (about 33-35 lbs) for a Costco (Interstate/Johnson Controls) 51R battery and trimmed about 8lbs off the front right corner. Only about US $10 per lb of weight reduction and the car got a new battery out of it good deal. The brakes seem to have become less effective since I've been away, and my wife made mention of it becoming more of an issue over the past month. I'll be inspecting the (new) rear wheel cylinder connections for leaks and checking out the front calipers when I install a set of Centric metallic pads ASAP. I think that a 3g brake booster and new master cylinder may be on the coming list of "resto-mods" for peace of mind. Foot on brake, start engine - brake pedal should drop slightly and stabilize. Release brake, stop engine - pump pedal till boost is depleted, should get one to two pumps at least before rock hard pedal. If the above doesn't net you good results and everything else is moving freely (sliders and pads in the saddles) and properly adjusted (shoes, park brake) and leak free, then look at a faulty booster or vacuum feed check valve. If you remove the vacuum hose from the booster and you hear a whoosh of suction, that is a good sign. I removed mine recently, and even after months, it held a vacuum in the booster. Unless the pads got glazed/overheated or as you mentioned the master is leaking internally which could cause a sinking pedal or stiff pedal depending on how the internal leak works out, then that wouldn't be great news. I just bench bled my new master with plugs inserted into the outlets. Kinda neat I got the car nearly air free with a gravity bleed and few special techniques. My young lad mentioned he wanted to help out this weekend, and I think that means a pedal pumper! Hope you find something obvious! Greetings Nick, my sister a, few months back, moved to boulder creek, and that exhaust manifold crack... it looks vary familiar . Also the brakes on these car from the factory are a joke [to put it mildly] get a set of "91-"95 Mitsubishi expo front knuckles along with the brake rotors, and calipers, or if you want an even bigger brake setup get the expo knuckles, but use the "91 Galant vr4 rotors and twin pot calipers instead, both options are a whole lot better then the stock non vented brake setup, and considering all the hillside driving I'd make this the top of your priority list. also if you need any of these and can't find em let me know I have some spare expo parts.